Today Twitter announced a partnership with Nielsen in which the social network will offer advertisers the option for surveying its followers within the app. The service will be tested with select advertisers, and has been projected to be launched to more brands by early 2013. In the first iteration of the service, some users might begin seeing tweets from @TwitterSurveys on their Twitter timeline in a format that’s similar to Promoted Tweets. Advertisers will be able to target demographics of users, and of these select tweets will appear on both desktop and mobile devices. Survey participants will be taken through a simple process, which, depending on the number of questions, shouldn’t take longer than a few minutes. Since the surveys will appear on your timeline, you’ll have to click on the link provided within the tweet and it will open up a new page within the app where you can answer a few questions. “Building on Twitter’s mobile heritage, we’re giving brands the ability to deliver and measure the impact of mobile and traditional desktop campaigns through these surveys,” Twitter explained in its blog post. Nielsen, as a partner, will be analyzing the results. The new feature will be one tool for brands to increase engagement with followers. On the user end, as Twitter outlines, the new mechanism is a direct way for advertisers to find out about their customers’ “purchase intent, overall awareness, and other advertising metrics and analytics.” What this means is that Twitter can now offer its advertisers a tool for finding additional insights about the consumer sentiment and how effective the brand is among its followers. Right now advertisers are only privy to engagement metrics like tweets and retweets. 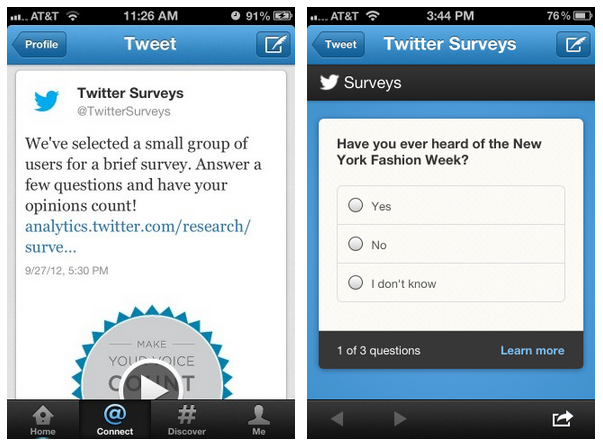 At the moment, Twitter doesn’t offer any incentives for a user to participate in these surveys. The consumer survey isn’t exactly a new method; plenty of websites request user participation and feedback — and plenty of them get passed over once we realize there’s nothing in it for us. Without any motivation for us to offering up this information, Twitter could find its surveys getting the cold shoulder. The new feature is another reminder why Twitter has struck so hard against third party clients that replicate its service: This type of mechanism will only be available when you view the proprietary Twitter client — something like Tweetbot wouldn’t surface this, because advertisers work directly with Twitter to offer and target these surveys. So control over the platform, and making sure eyeballs are on its platform, is necessary to make it work and make this a value add for marketers. Right now the account @TwitterSurveys is protected so you won’t be able to see its Tweets or the surveys that it’s publishing, but the above screenshots are a good look at what you can expect.